This fellowship began in 1901 as York Street Mission. The Church was built on the land at Roman Road in 1908. Below is a excerpt written at that time. Delightful weather prevailed on August 8th, and great joy and high hopes were written on the faces of those who assembled at Failsworth. The friends gathered in large numbers at the old meeting place in York Street, and gave an official good-bye to the temporary premises as they started in procession. With the Hollinwood Salvation Army Band leading, the procession traversed the principal streets, and returned to the new building at 4 o'clock. After prayer by John Crumblehulme the door was opened by William Cann, who before doing so delivered an earnest and encouraging address from the steps of the building open fro worship and the preaching of the Gospel. In the Hall after a large audience had assembled, hymns were sung, and a Bible presented to Mr. Cann as a souvenir of the occasion. Tea was next partaken of, and at seven o'clock John Crumblehulme presided over a large gathering. The speakers were Aaron Crossley, Daniel Hatton, John Firth Wood, J.T. Dayton of Stalybridge, and G.W. Davenport of Hollinwood. On Sunday, August 9th, John W. Hancock preached in the morning, and John Crumblehulme in the evening. In the afternoon a Service of Song was given by the choir. Great blessing attended the first day's services in the new building, and at the close of the evening prayer meeting seven persons made confession of Christ. With the opening of the new building the Church begins a new era in its history, and we trust that the future may be rich in usefulness and blessing. 1890 Failsworth map shows that York Street and the houses opposite the current site are not yet built. 1900/01 House fellowship formed in York Street at either number 32, 34 or 36. 1904 Estate agent approached re the land. 1905 Lease was obtained for the land in December. 1906 Outdoor services were held on the land in January. 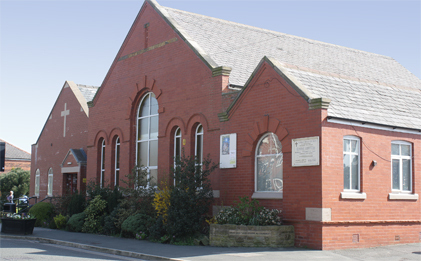 Contact was made by the Independent Methodist Connextion with the prospect of a mortgate loan. 1907 Plans for the building were drawn up. 1908 Local builder commenced work in April. There was heavy snow at this time. May 16th - The foundation stones were laid. August 12th - ROman Road Mission was formally opened. The building was erected in 12 weeks. October - one week mission took place led by Miss Coulthard. 1914 The First World War - many men were away. 1916 A second mortgage was obtained. Electric lighting was installed. 1920's Scouts and Guides in existence. 1930's Scouts and Guides disbanded. Walter Booth recognised as a Minister. 1934 New list of Trustees. 1937 James Stuttard recognised as a Miniter. Clifford Ward attended for the first time. 1938 Clifford Ward become a Member and was led into teaching and preaching. 1939 The Second World War started. 1940 Clifford Ward was called up to serve in the War. 1945 The two ministers left and transferred to George Street, Oldham. The names of Clifford Ward, John & Leslie Johnson offered as candidates for the ministry. 1948 5 Oldham students were recognised as Connexional Ministers on August 21st at King Street Church, Oldham. 1949 THe upper walls in the hall were painted for the first time. The main source of income at this time was from jumble sales, pantomimes, annual fair and Gift Sunday. 1950/51 Clifford Ward was away at teacher training college. 1951 The building is licensed for weddings. The wedding of Ken & Edna Clegg took place. This was the first wedding at Roman Road. 1957 Afternoon Sunday School built up to 100 scholars. The communion platform and rails were fitted. 1960's After discussion at a special meeting to consider the state of the building and spiritual life. The decision was to face the challenge. 1964 Sunday School began to decline. Morning Sunday School ceased. Dry rot began to develop in the building. 1968 Organ fund set up. 1970's Youth Development 'Project' (competition) won by Roman Road for several years running. Electricc organ piano was in place. 1971 The Mission's debt was 'written off'. 1974 Toilet extension added to the kitchen. A new youth club was formed. Fundraising effforts through public and internal subscription. 1980 Discussed the Church coming into full union was the Connexion. 1981 Prayer vigil and re-dedication. Christian Endeavour annual convention was hosted in Oldham. Joint youth work with URC Oldham was established. 1984 Two students enrolled for the Ministers Education Course. Youth club attendance was declining. Leaders were Mr. C. Ward, Mr & Mrs. Bell, Mr. T. Savage, Mr. D. Barron, Mr H. Kelly & Mrs. N. Lenihan. 1986 January 29th - Dorothy Kendrick attended for the first time. July 13th - New lectern 'fall' dedicated. This was provided by the relatives of Sam Wild. 1988 The Church considered setting up a fund for an extension. Dorothy was invited to consider taking the Minister's Education Course. She was joined on the course by John Sutcliffe. October - Mr. T. Savage resigned due to ill health. December 10th - Recognition Service for Derek Barron and Henry Kelly as Ministers. 1989 Dorothy Kendrick and Clifford Ward involved in vision and work of Ellel Grange Healing Centre. 1991 March - discussions took place with an architect re an extension to the existing building. 1993 Pram-service on trial for 4 weeks. Derek Kemp (Church Projects) invited for feasibility study and commissioned to draw up plans for an extension. 2001 Maintenance of the building continued. 2002 Pure NRG began (now Rock Solid). Employed PAIS worker to help with children's work. Reconsidered plans for a single storey extension. 2003 Derek Kemp re-drew the plans and a targe figure of £150,000 was agreed. A new architect was appointed who drew up plans for a single storey extension. 2004 Building of the new extension began. Groups and services continued throughout this time. 2005 The building was completed and opened at a celebration weekend. September - the wedding of Rachel and Scott Lawson took place. This was the first wedding in the new building.